Dinner time is the most stressful part of my day, but it is also the time of day that my family actually gets to sit down together and talk. I want dinner to be fun, delicious and of course EASY. I have been working really hard to come up with a list of fun, easy and delicious meals that I can make for my family on the fly, and that they will love. 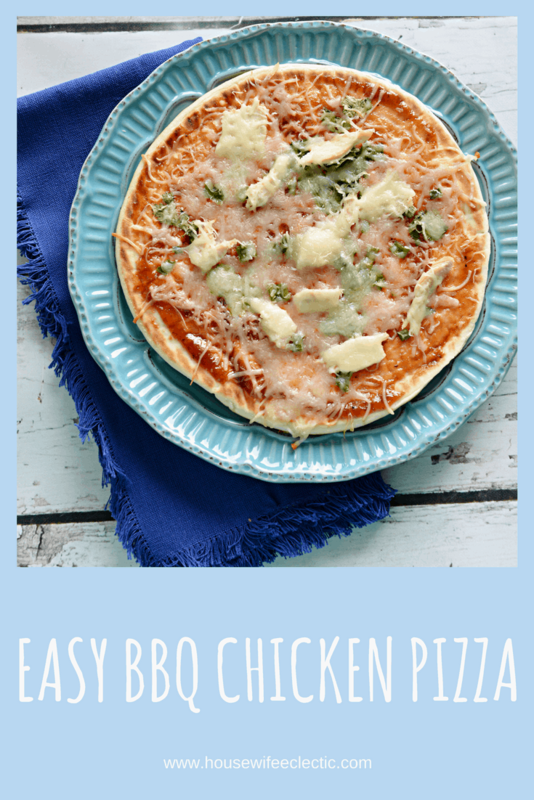 This Easy BBQ Chicken Pizza is simple and fun. To make dinner even more fun, I pair this pizza with a Shirley Temple for each of my kids. Sometimes, I even light a couple of candles and turn off the overhead lights. It takes a simple dinner and turns it into a family experience. My mom used to make me Shirley Temples when I was a kid. It made me feel so grown up to have such a pretty drink and now I love making them for my kids. They are such an easy way to make your kids feel special. 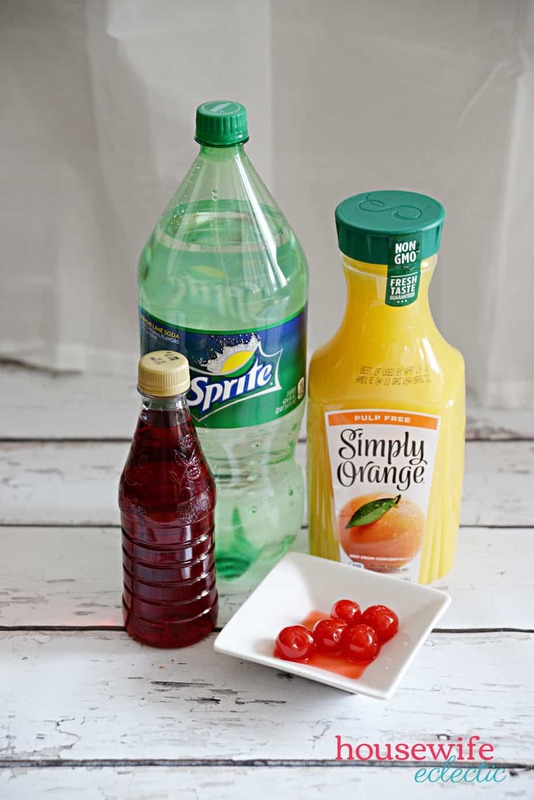 I usually buy the Sprite in the 2 liter 4 packs at Sam’s Club and keep them in the pantry so I always have it on hand to make these drinks or if one of my little ones get sick. Add ice to each cup. 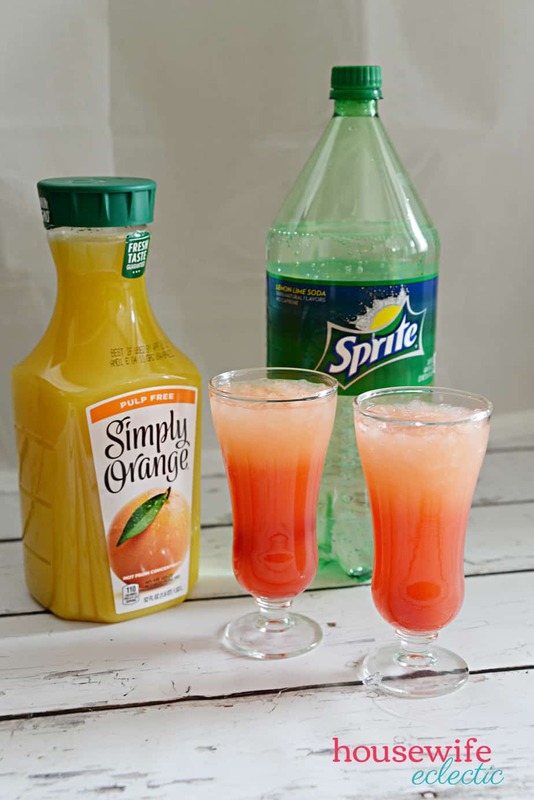 To get the pretty swirl of colors add the orange juice, then the sprite, then the grenadine. Top with maraschino cherries. 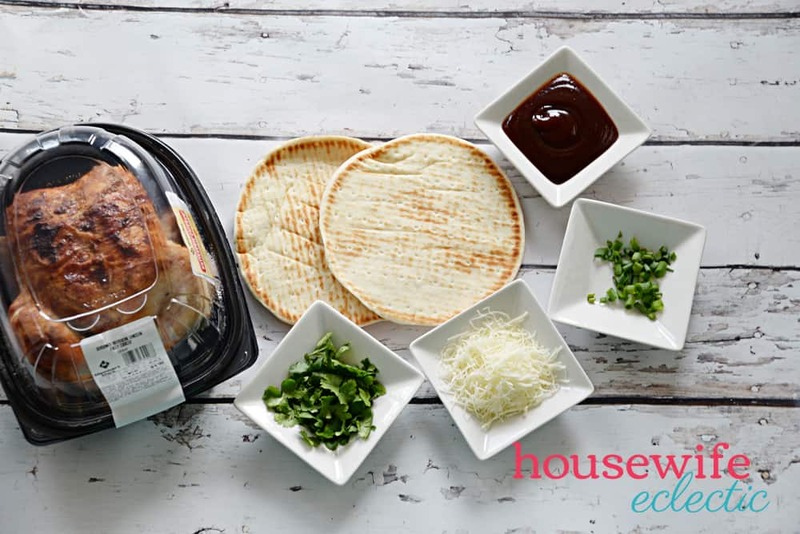 For these pizzas, I grab a rotisserie chicken from Sam’s Club to make them even easier. Even better, Sam’s Club has Member’s Mark Meals, Side and Salads in their refrigerated section so if you don’t have time to make anything at all, you can still grab something that will taste homemade for your family. I particularly love their selection of salads and sides. 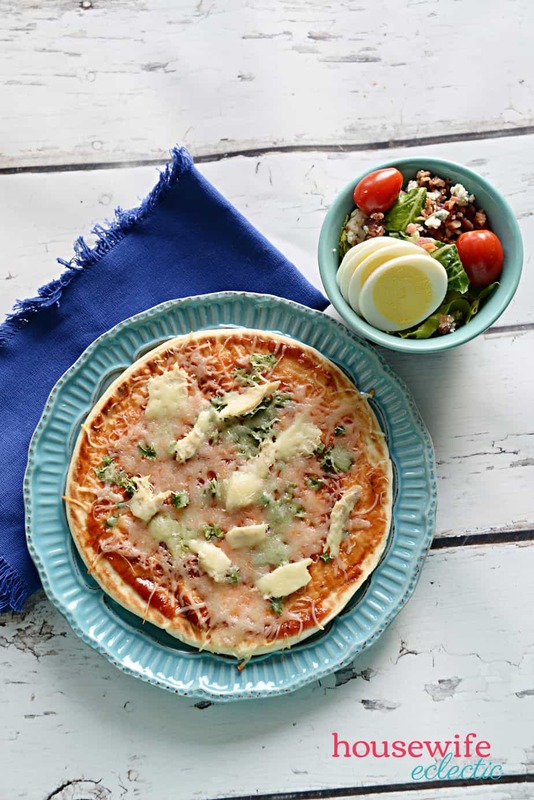 I usually buy a salad to compliment these fun and easy pizzas! 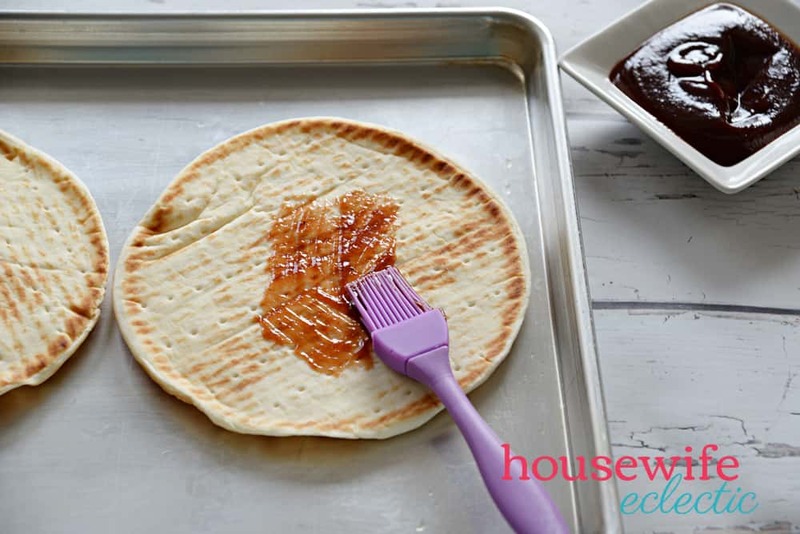 Brush the pita bread with BBQ sauce. Make sure to get the BBQ sauce all the way to the edges. Top the sauce with chopped green onions. Add the cilantro. You can skip this step if you aren’t a cilantro fan. 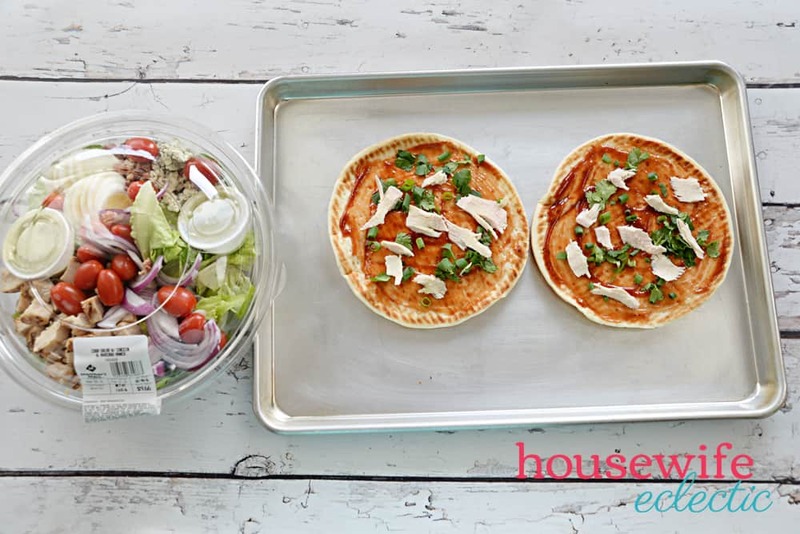 Cut pieces of chicken off of the rotisserie chicken and add them to the pita bread pizzas. 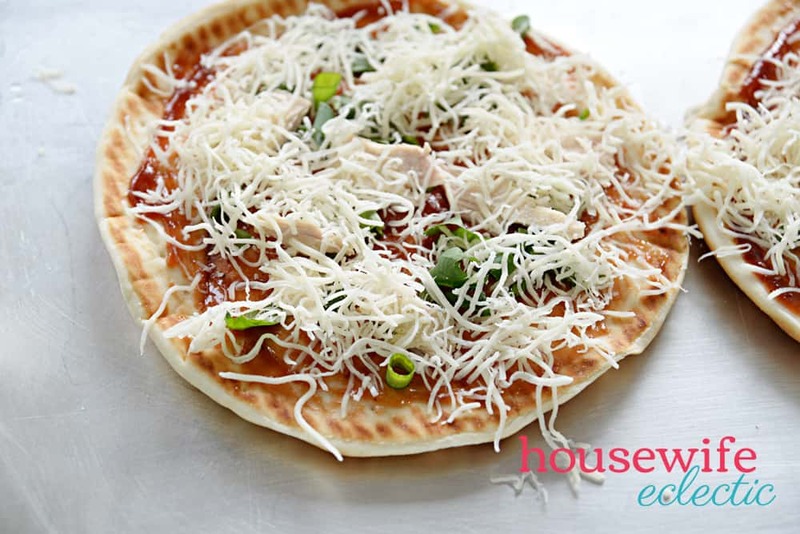 Top the entire pizza with mozzarella cheese. Bake in a 350-degree oven for 7-10 minutes until the edges turn golden brown and the cheese is melted. Serve with a delicious side or salad from Sam’s Club and a Shirley Temple. My local Sam’s Club carries a Chicken Cobb Salad with bacon, cheese, and hard-boiled eggs. 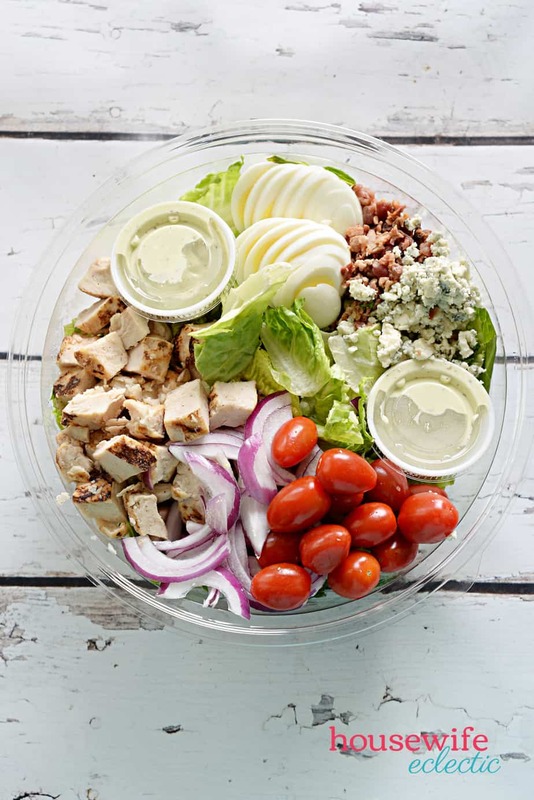 It is the perfect salad to pair with a pizza. Some of the side options from Sam’s Club include an Asian Noodle Salad with Chicken, Rotisserie Chicken Salad, Twice Baked Potatoes, Asparagus Pomodori and Assorted Green Salads. Need a main dish as well? You can check out the Grilled Chicken Fettuccine Alfredo, The Stuffed Poblano Peppers with Cheesy Grits, or even Meatloaf and Whipped Potatoes. There are more than 10 different meal choices for when you are in a pinch. These meals are all fantastic and can make your life easier and even bless the lives of people around you. A few years ago, I was in a nasty car accident with my daughter. Everything hurt and I had no desire to stand up and make dinner. A lovely neighbor dropped off three different Sam’s Club meals for us that night and I am still grateful for her generosity. She made sure we had good, nutritious food for our family for a few days. It was the perfect gift. Now, when a friend has a baby or a bad day, I love to grab one of these meals for their fridge, so they have one last thing to think about. My kids absolutely adore Simply Orange® and I love that is it NON GMO, not from concentrate and that I can get a 2 pack for a great deal, so I bring it home for pizza night and every night in between. Click here to browse more dinnertime ideas from Sam’s Club. Which meal would you try? Simply Orange and Simply Lemonade are registered trademarks of the Simply Orange Juice Company. Here in the northeast, Shirley temples are not made with OJ, but that sounds like an interesting drink idea. I am sure my kids would like them. 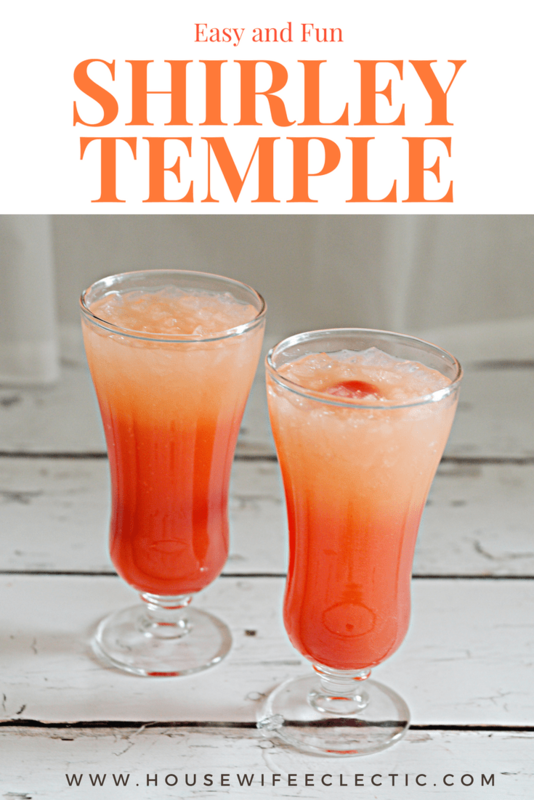 Shirley Temples are always such cute and festive drinks and my grandkids love them too! Your pizza looks delicious and so easy to make. What a great combo! That pizza looks delicious and the refreshment you made sounds refreshing! I would like to try the BBQ-styled pizza. Always good to find new ideas on what to make with chicken. Shirley temples we have never made before. All sounds delicious. Yum, this is my kind of meal! I’m all for easy stuff. It’s been ages since I’ve had a Shirley Temple. I’ll have to make some this weekend for my kids and I! I was just thinking about pizza. I guess this is a sign we will have pizza for dinner. Thanks for helping me decide dinner with drinks. Now that looks like a great idea! It would be a fun family night to make a barbecue pizza and and have Shirley temples. I think we will do that this weekend! Shirley temples are a family favorite. Love how you added orange juice. The pizza looks so yummy. I have to try the recipe. What an awesome meal. 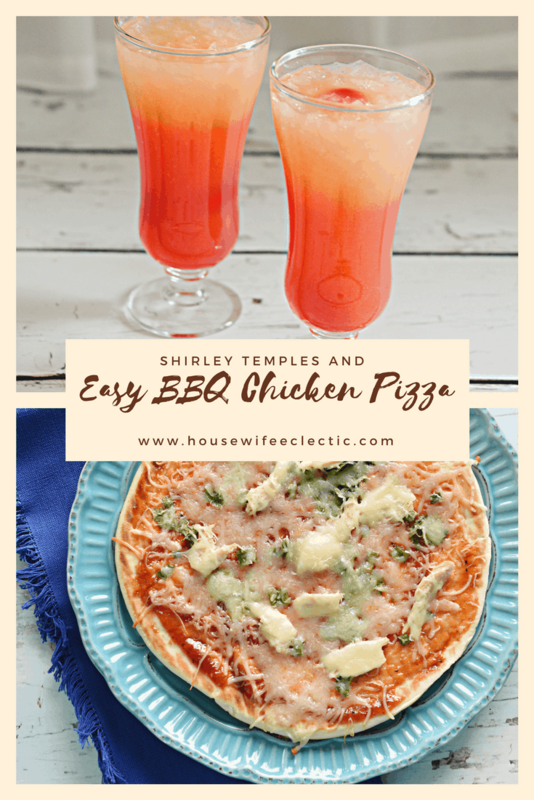 Love the BBQ Chicken pizza recipe, and the Shirley Temples look yummy! I’m sure my kids would love those, and I wouldn’t mind one myself! That’s fun. I don’t let my kids drink soda, but there’s nothing more fun than a fizzling root beer float or a Sherly temple to celebrate a special occasion. I haven’t had a Shirley Temple in such a long time!! When I was a kid we used to have them all the time at birthday parties. That’s amazing. 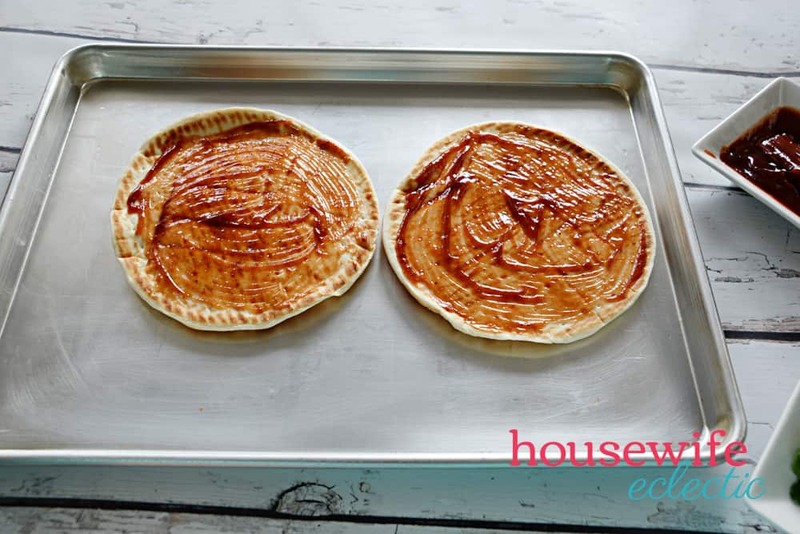 I love that you can easily make this at home especially when you don’t have a lot of time! It’s also nice to do this for friends and family who need a little help with getting meals ready, such a kind thing to do. BBQ Chicken pizza is one of my favs! I always like pizza flavors that are not traditional cheese or pepperoni. I love that you paired a drink with dinner. A lot of recipe sites don’t do that. Thanks for these recipes they are very different but look delicious. We just had pizza night last night, but I think I want to meal plan for this next week. Thank you! The Shirley temple and the pizza are both lovely dinner ideas and I’m sure the family will appreciate them. I like that both are completely easy to make! What a nice way to catch up with family. Indeed having some dinner moments like this makes it more enjoyable. 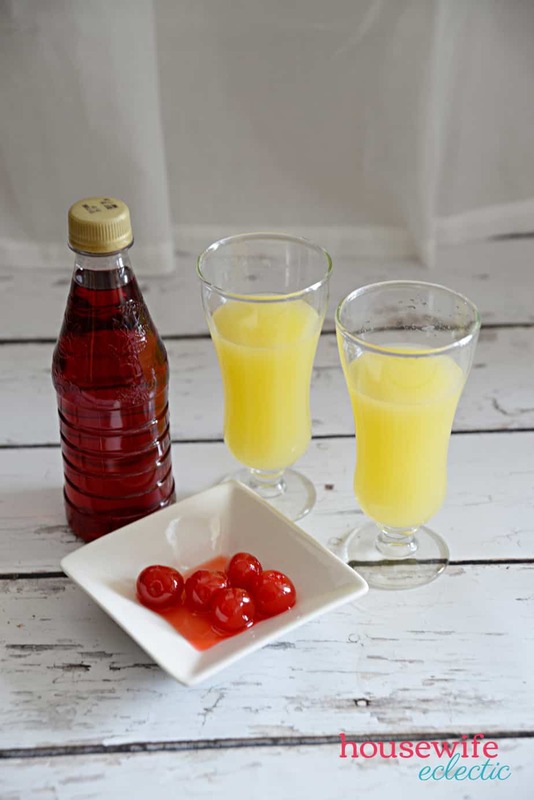 I love how you made a twist with ordinary soda and juice too.